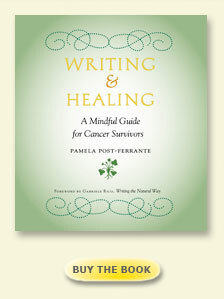 For the past year, I’ve been editing my own book, Writing and Healing: A Mindful Guide for Cancer Survivors: two, three, four, five to ten times through. I like to edit, to tighten a sentence so that it’s meaning is just right. It’s like cleaning out a drawer – what’s not needed you pluck and toss. There is order: everything is in its right place. The nice thing is that written words don’t get out of order again like a drawer. I love words; to find them in the air and make them permanent on the page, but editing my own words over and over is like weeding a garden, not like the joy of watching a flower unfold its petals.